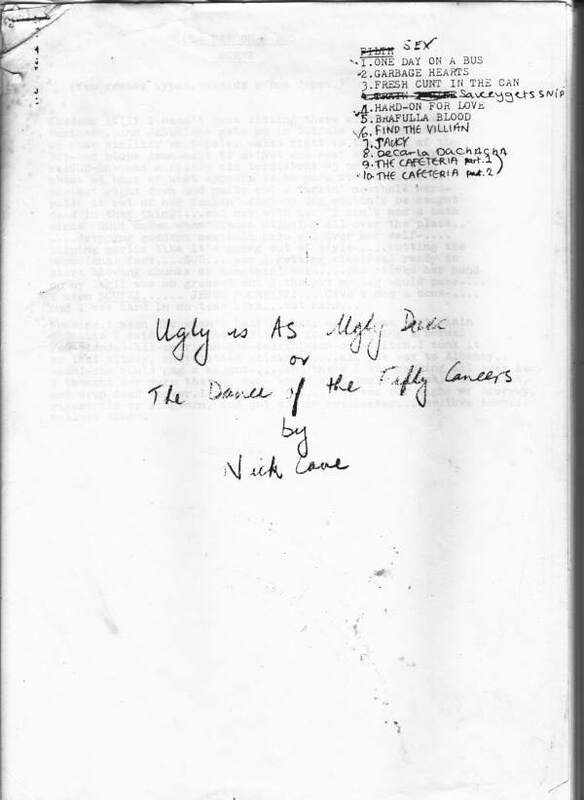 " UGLY IS AS UGLY DOES"
"THE DANCE OF THE 50 CANCERS"
In October 1981 Lydia Lunch met The Birthday Party in New York during their first tour of the US. She travelled to the UK to support them on their November shows and cornered and cajoled Nick Cave into writing some (theatre) plays with her. The pair started writing in December 1981 in London, finishing about 10 one page plays. 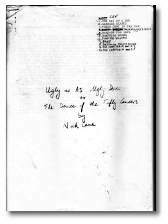 Nick wrote about 40 more on his own in London until about July 1982. One of the plays was performed live by Lydia Lunch with Swans @ the White Columns gallery in NYC in May 1983. Late 1983/early 1984 an Australian theatre company attempted to stage the plays, but the effort was soon aborted. Five were first published in the US magazine Forced Exposure (1985/86), 14 appeared in Nick Cave's "King Ink" book in 1988. 10 were also used as a basis for Mike Matthews "AS-FIX-E-8" 1993 comic strip. In total 27 plays have been published so far. The remainder has never seen the light of day until a kind soul recently released copies of the typoscripts from his archives. Made by Hans (don't forget to remove the anti spam section).